If you're moving home, using self-storage can make life so much easier. We look at how to do it right with these practical self-storage tips. Americans are not moving as much as they used to. In 2016, only 11% of Americans moved, a historically low rate. Moving is one of the most stressful things we can go through. Why aren't we moving as much we used to? Maybe it's to avoid the stress of moving, or maybe it's because we don't have to. If you are considering moving because you need more space, you have more options than ever. Self-storage is a great option for people who need more space for their stuff. Keep reading for more information about self-storage units and some of our top self-storage tips. If you find yourself needing a secure place to store your belongings, self-storage is a great option. Maybe you are in between houses and staying in an apartment that can't fit all of your things. Maybe you have inherited a large number of items or you just have a lot of stuff you can't seem to part with. The good news is, thanks to self-storage companies, you can store your extra belongings at one of their facilities and rest assured that they are safe. It's important to choose the right company for your needs though, as you want to make sure your stuff is in good hands. There's a lot to consider and doing some research beforehand will go a long way, especially if it's your first time using a self-storage unit. Keep reading for some dos and don'ts to help you navigate the process of moving and storing your stuff. Choosing the right company to store your things is probably the most important step in this process. Parting with your prized possessions is hard for anyone. Even if your items don't have much monetary value, they probably have sentimental value to you. You are entrusting the safety and security of your items to a third party, essentially a stranger. You want to make sure that you choose a company that is reputable. The company with the cheapest rates is probably not the one you want to go with. Use the internet to your advantage. Read customer reviews on the companies you are considering. View the area that the unit will be located in on Google Maps to determine if the area is safe and convenient for you. You can view here a website specifically designed to show you storage units available in your area. You should ask friends and family to refer you to a company that they have used and been happy with. Trust your gut and walk away from any company that seems sketchy. You'll want to know what exactly you plan to store in order to accurately choose a storage unit size. This will always help you stay organized throughout the process of moving and storing your things. Having a good idea or a list of what all is in your storage unit will alleviate stress and eliminate panics about missing stuff that are bound to occur. Once you've taken inventory and created a list of your belongings, you should label each box with a description of its contents. Not only will this help you organize your stuff within the unit, but unpacking will be so much easier. If you are planning to store your things in a storage unit, you probably won't be using them for some time. If you don't label your boxes, you are bound to forget what was in them. If you do need to grab something from your storage unit, finding it will be simple if things and labeled and organized accordingly. Make sure you have coverage for the items in your storage unit whether you have a renter's or homeowner's insurance policy. Your policy should cover personal property in storage, but if it doesn't, make sure you get it added or purchase a second policy. You might be able to purchase a storage insurance policy through the storage company. You can rest assured knowing that if something beyond your control happens to your items, you will be covered. Even if you are just moving things into storage, you might need some help from friends or family. You can use an extra set of hands to carry boxes and help move furniture. It's better to ask for help than risk injuring yourself. Make sure to purchase a top of the line lock if you are renting with a company that requires you to purchase your own lock. This is not something you want to skimp on. The security of your valuables comes down to the lock on the door of the unit. Purchase a lock that is tamper proof to reduce the chances of anything happening to your belongings. You'll have a much easier time moving in and out of your storage unit if you have a strategy when moving your things in. After you have labeled your boxes, organize things within the unit according to the labels. Put the things you are less likely to need before you move out at the back of the unit. Place things that you could possibly need to access in the meantime towards the front of the unit. Most storage units are at least eight feet tall. Use this height to your advantage and stack your boxes to the ceiling. Obviously, you'll put the heavy boxes on the bottom. Finally, create a path between the boxes in the unit so that you can easily move from front to back in case you do need something that you put in the back. You should begin searching for a storage unit company as soon as possible. To increase the chances that you can secure a unit that meets all of your needs including price, size, and location, start searching early. The longer you wait to book, the fewer options will be available. The last options to go will probably be the less desirable choices. It might take some time to research the best option for you, so get started now. You don't want to wait until the last minute and have to make a rushed decision. They say that you shouldn't store anything in a storage unit that you can't afford to lose. It's best to keep your most valuable items with you, allowing you to keep a close eye on them. 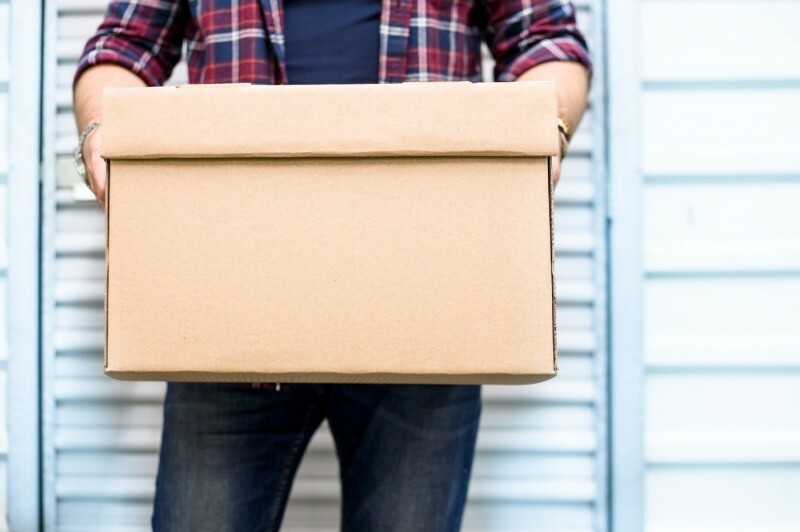 While self-storage is a safe option to store your belongings and it's highly unlikely that anything will happen to them, there is always a risk when leaving them in the care of someone else. Your items could get damaged, stolen, or lost. Items that we recommend keeping with you rather than storing include family heirlooms, jewelry, art, and any values that you don't want to risk losing. Taking the time to properly pack and store your items will ensure their safety and lessen the risk of them becoming damaged. Make sure to cover your furniture with blankets or moving pads instead of plastic. Plastic can trap moisture and create mildew and mold. Small items need to be placed in boxes. Fragile items should be wrapped in proper packing paper and stored so that they cannot move on their own. Using common sense when packing your items will make sure they are safe both during the move and during their time in the storage unit. Since your items will most likely be stored for some time, be sure not to leave any perishable items in your storage unit. Items that could spoil will create bad odors. Spoiled food will attract bugs and rodents. Not only are these pests gross, but they could cause serious damage to your property. Whether you have a key or an access code, you should treat your storage unit with the same level of caution as your home. Be careful who you share the access information for your storage unit with. Don't allow strangers or anyone who you do not trust with your belongings into your unit. Items in storage units are often targeted by criminals. Do your part to protect your items by controlling who has access to them. While these are some of our top self-storage tips, the most important thing you can do is use common sense and plan ahead. Most of the tips we have discussed in this article come down to being careful with your things and coming up with a plan. Self-storage is a great resource for those in need of extra space, but if you're not careful you could be putting your items into the wrong hands. It's important to remember that it's okay to ask for help. Consider hiring a moving company to help pack and move your items into your storage unit. For more information on choosing a moving company, check out this post.